TVS are known for making seriously impressive sports motorcycle in the category where Apache belongs. 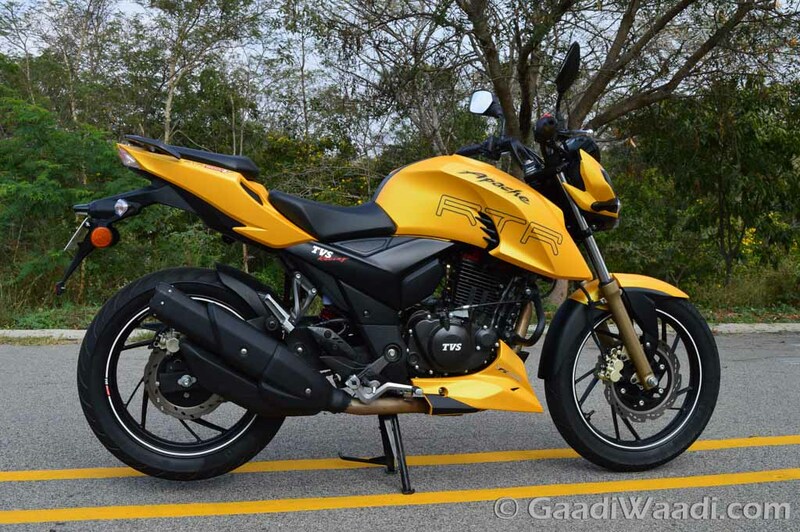 The RTR 160 was a revolution when it came, the RTR 180 wasn’t critically accepted as everyone was expecting a 200/220cc but nevertheless that had nothing to do with the product. The motorcycle was a great thing to live with as it had a splendid engine, race inspired engine and chassis which worked in tandem well and was oodles of fun to ride. The noise, the direction changes and everything else the motorcycle did, was exactly what enthusiast wanted. The motorcycle on the other side, the Pulsar 180 did not do that well enough and RTR 180 was performance king. 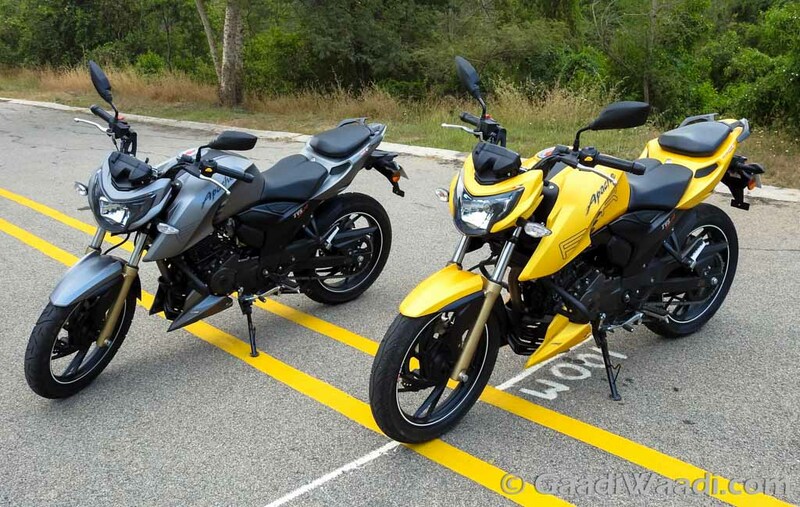 Obviously, the real competition was the Pulsar 200, but that was sadly discontinued in 2012, Something sort of similar has happened today and we have finally witnessed the Apache 200 RTR 4V. The new bike has come up on the same platform with major changes to it in every manner, we tested it at the test track of TVS in Hosur. After all these years, is the new Apache worth the wait and properly revolutionary? We find out! 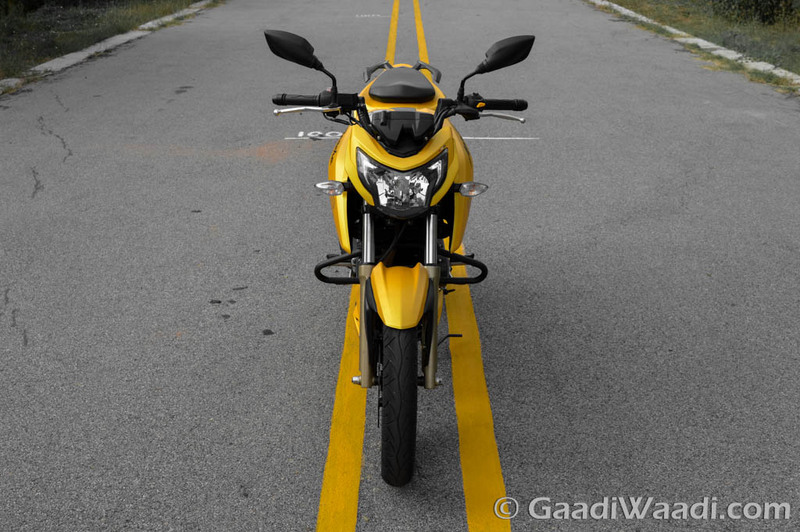 The styling has to be the best part of the 2016 TVS Apache RTR 200. The slim headlight cowl and integrated headlight clearly remind you of the Ducati StreetFighter of the past. LED lights are fantastic and look Gothic. The.The long length of the motorcycle, the large tank extension, the vents inside them is all perfectly executed. The best balance of edgy and bulky design, seen after a really long time. The engine belly cowl, the side panels, the golden color forks and other small cycle parts such as pedals, levers, all remain the same giving it the characterful Apache look from a distance. What’s new is the raised tail section which has a split seat arrangement, the reason why the motorcycle looks long. The cowl has faux air ducts which are just out of the place. Offset gas cap, with a red flap lid makes it look cool. Exhaust is another major highlight of the bike which looks like a army weapon of some sort. The multi-spoke alloy wheels are new and add to the sportiness of the package. The partition LED tail lamps look great and are an evolution of the older Apache. Speedo is another a great feature in the new Apache, the smart phone inspired LCD screen with a white backlit light looks good. 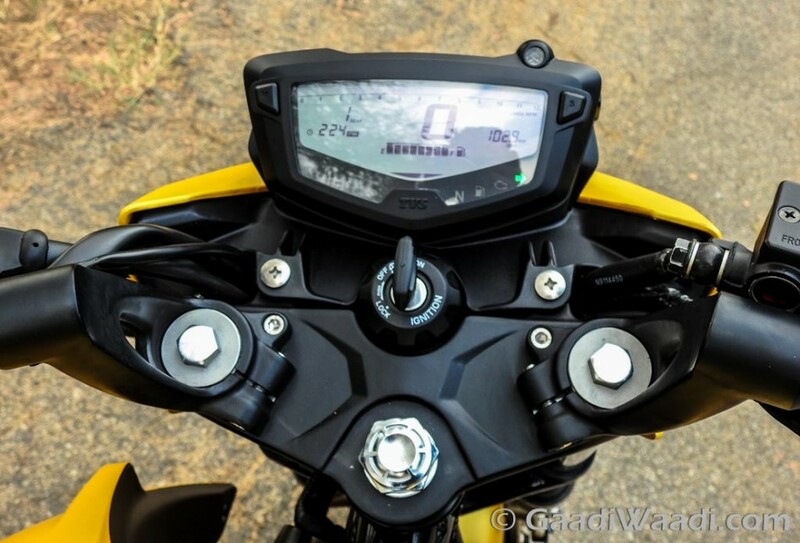 The all digital speedo comes with host of features this time around. You get a lap timer, average fuel consumption, time, two trip meters, a message saying everything when you go through the various features. There is a service meter, battery indicator, gear shift indicator, time, fuel gauge. On the outside of the console, you get fuel warning light, solitary turn indicators, ABS light along with neutral and high beam indicator. Switchgear and palm grips remain the same are really high quality like before. Rear set footpegs are seen on the 2016 TVS Apache RTR 200 4V like other Apache’s of the past. 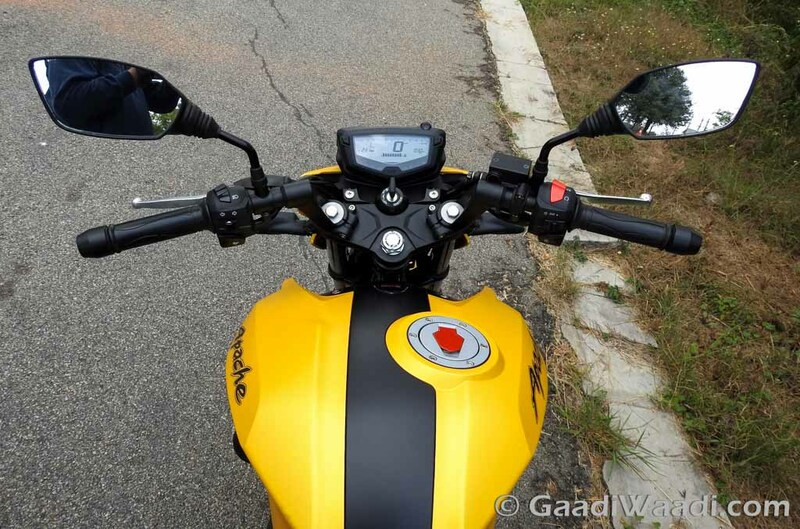 The riding position is upright and the handlebars are raised and towards gives you commanding position over the front-end and the motorcycle. The position sort of reminds of the Duke’s. However, Apache continues to be the same when it comes to legroom for tall riders as it is a bit roomier than before, but not by much. 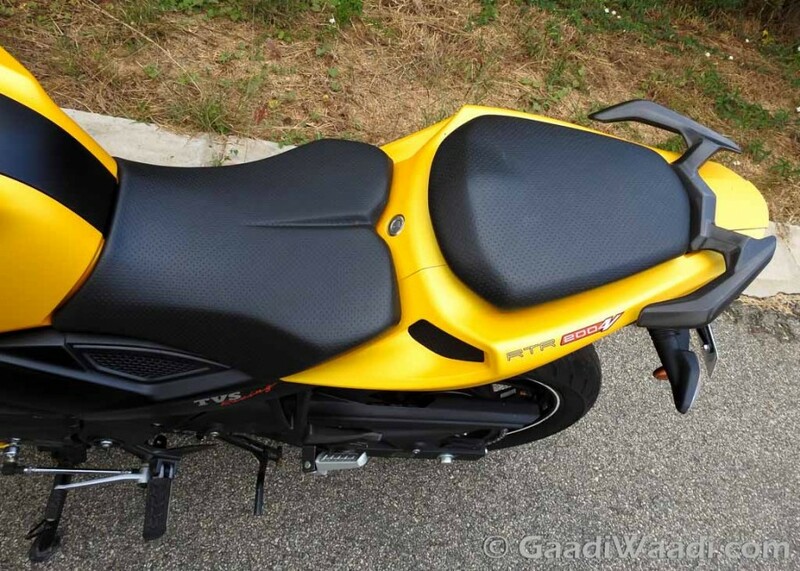 Seat are comfortable and well padded for rider and pillion. Grab rails for the pillion rider are smaller, but they should do the job well enough. Powering the new Apache 200 is a new SOHC, 4-valve engine air and oil-cooled engine that makes 20.5 PS of power and 18.1 Nm of torque. The engine is very smooth, refined, and NVH levels are really good. Good part is that there are no vibrations anymore. The engine noticeably spins faster, is free revving than before and there is a lot of tech gone into the engine to make sure that happens. 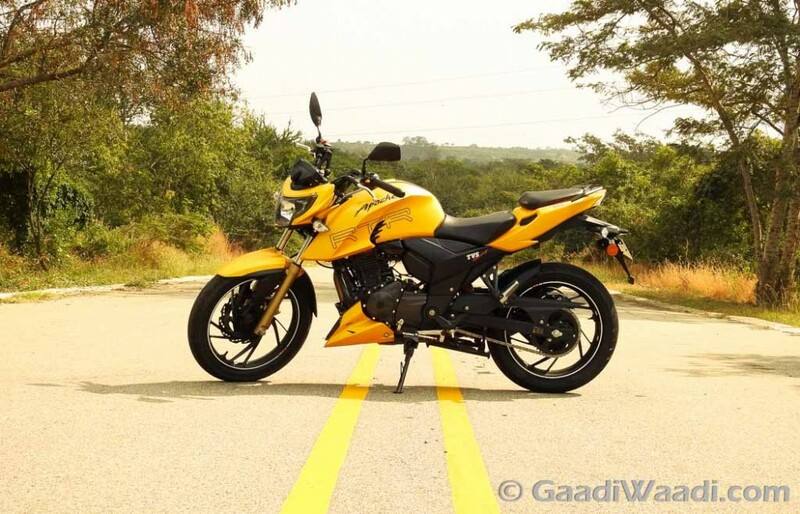 A lot of things are done over the RTR 180cc to ensures reliability, performance, efficiency and emission are met. The engine head is red in color which signifies that the use of 4-valve is done for the first time. TVS have introduced RAM air ducts inside the bikini fairing to specifically cool the engine parts unlike before, with the 180, they just improved aerodynamics by 10%. The spark plug, the head, all thanks to the oil-cooler, the engine now runs cool 90% of the time. New parts include, nanofriks coated pistons, new crank cases, strengthened gearbox, same ratios as the RTR 180 with minimum changes. So how does the engine feel with the new 4-valve head, it doesn’t have much of pushy low-end grunt, but it does the job. The mid range is very well screwed and thanks to a larger 45 T sprocket the response is instant. The torque curve in combination with that works very well. 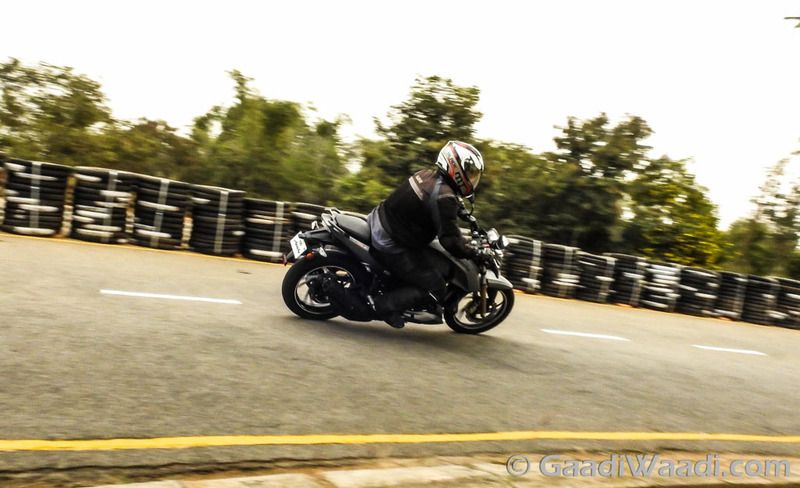 Top-end couldn’t be tested at the small test track, but lighter riders saw 125-126 km/hr. We are sure it can go higher as we reached 8000 RPM only in fifth gear and there is more to squeeze out on a larger stretch of road. Power tappers out after 9000 RPM despite the fact the redline is at 11000 RPM. Gearbox is smooth, clutch is light thanks to 6 plates instead of the usual 4. The gearbox, is way too smooth for any feedback from it, ideal for commuting. 0-60 is done 3.9 seconds and 100 comes in under 12 seconds, according to TVS, we think numbers will change once we do road test on it. The intake noise on the Apache is brasher than before on the carb variant which is typical Apache character as it makes more power and torque. Exhaust note isn’t as throaty as before, but it is identify-ble as an Apache from a distance like before. The FI-engine on the other hand is very sophisticated when it comes to everything. 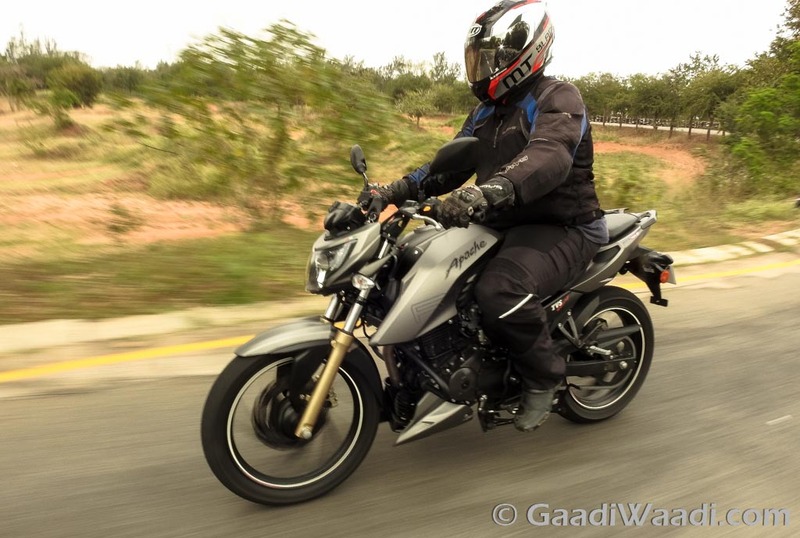 The engine is smoother, consistent in fuelling, especially at higher RPM, the pull is stronger, and along with .5 PS increase, the top-speed increase of 2-3 kms was seen over the carb variant. The exhaust note on this is slightly muted, but the intoxicating intake noise, remains in a more sedate fashion. The engine feels it can go on and on as it is extremely refined. 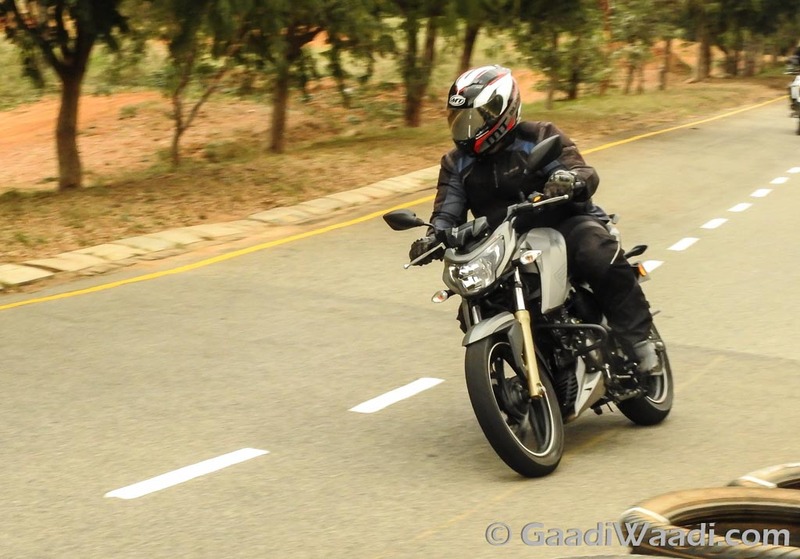 Overall, we miss the raw character of the RTR 180, but with so much refinement and cruising ability it promises, the flexibility in sporty riding on road, track and daily commuting that we can outlook those aspects, which are just a notch below, nothing more, as the fun to ride experience remains with the new generation Apache. On paper if we see, we get the same double cradle stiff chassis of the past. However, TVS says it is an all new chassis which has been from grounds up, the engine is part of the chassis as a stressed member seen on most bikes. Wheelbase and length have been increased very minutely and there are clip-on handlebars like before. What’s new are fat front forks and monoshock suspension that is custom made by KYB. Start riding and you don’t feel like you are riding on something from the past. The chassis is quite forgiving, the direction changes are really quick for this kerb weight and segment and it feels light, agile and most importantly stable through the corners. The stability is the high point of the motorcycle as it has increased by leaps on bounds over the past motorcycle in a straight line too. 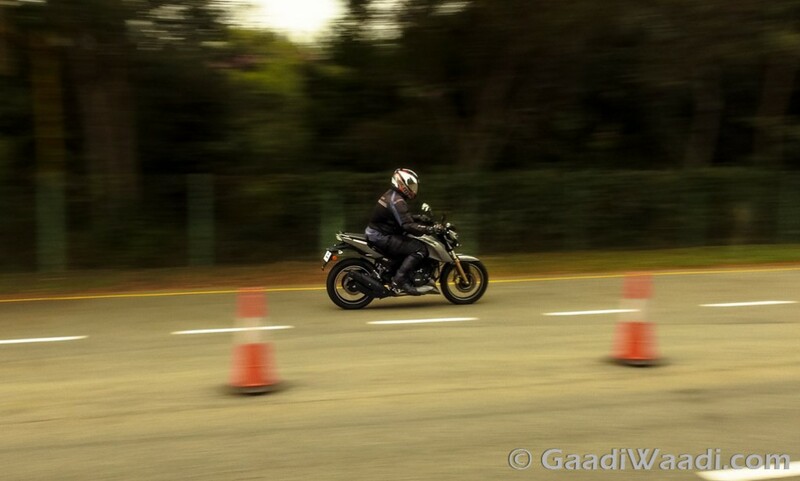 Cornering clearance, which can be seen on motorcycle at the test track is plentiful. However reach the limit and you do scrape the exhaust side. The problem lies in two noticeable areas which enthusiast like the most, the brakes and the front-end. The front-end seems under tyred and should have used 100 section instead of 90×90. 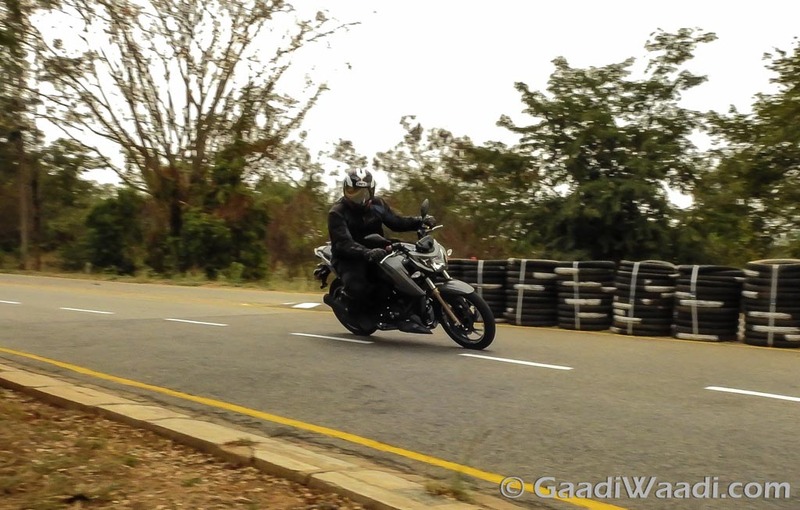 The front end gives up at the limit when taking a fast corner, sweeper and hence slow in, fast out is the best possible way for the Apache to be ridden fast. TVS tyres this time around were quite good too in the dry with the new Apache and adequate enough. We want to see how they perform in wet as that has been weak point of the tyres. Pirelli needless to say are brilliant and allow to definitely go faster through a corner. Brakes have enough stopping power, but the lever feel at the front isn’t that impressive. Rear brake is really good, no questions asked. What solves the braking issue to some extent are the Pirelli tyres, the feel improves noticeably, but it isn’t substantial enough. Reason why front is Sport Demon and rear is Angel GT because TVS says, the steering precision was best of both worlds when these tyres combination was used. Overall, the fun in riding the Apache just got better and it isn’t behind technology advanced rivals. 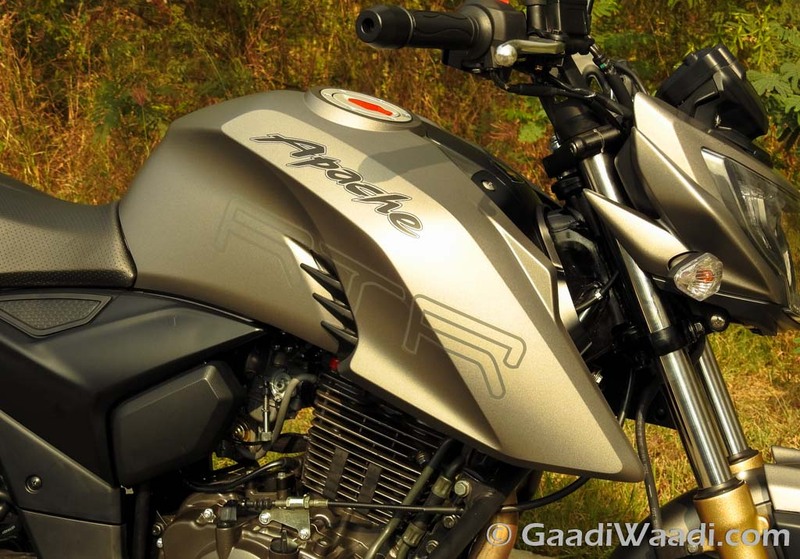 Apache RTR, the name always says that these bikes are always above the ordinary motorcycles that exist in the market. Sports category motorcycles is category which was just something in the books years back has properly evolved thanks to manufacturer such as TVS. 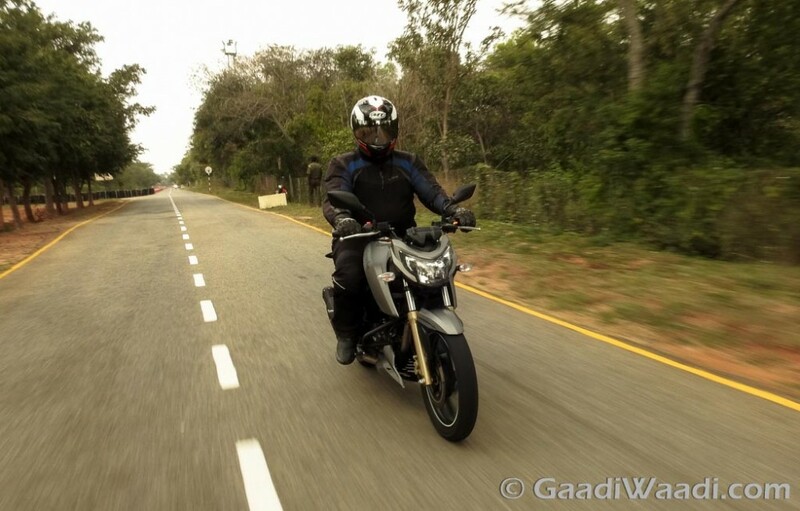 Apache continues to be a fun to ride motorcycle with extra horsepower onboard. The frantic character, yet the calm nature makes so much fun to ride and is signature Apache tradition continues with the new motorcycle as it meets all norms too, which is a great feat for the brand. Despite couple of negatives, it should be a great road bike, we are sure, as we test it later. 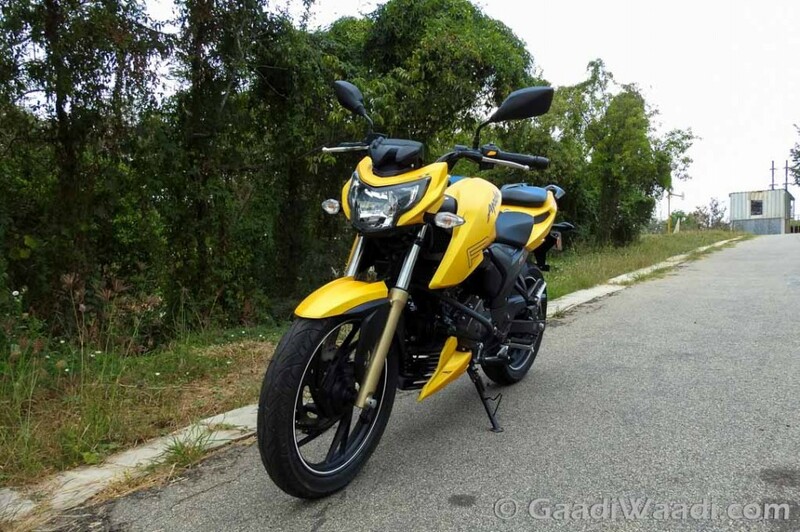 The Apache RTR 200 4V isn’t something we all expected, it still is something to look forward too. We hope there is something more planned in the very NEAR future on that aspect. 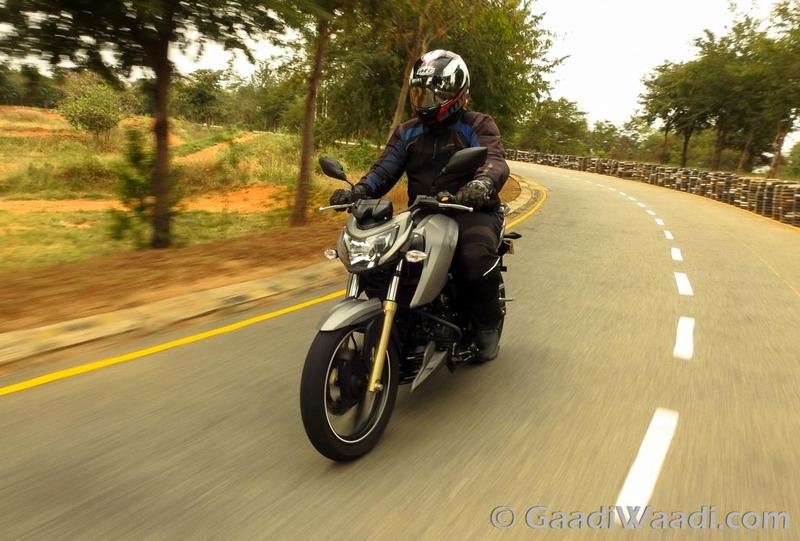 Meanwhile, we all should continue to enjoy one of the last few old-school motorcycles in the quarter litre category which are fun to ride and are flexible to do everything that we throw at it.